Roast Turkey Roulade with Southern Cornbread Stuffing, Pignoli Nuts, Sautéed Spinach and Sun-dried Tomatoes. Served with Toasted Marshmallow Sweet Potatoes, Shallot Haricot Verts, Homemade Cranberry Sauce, and Turkey Jus Reduction. 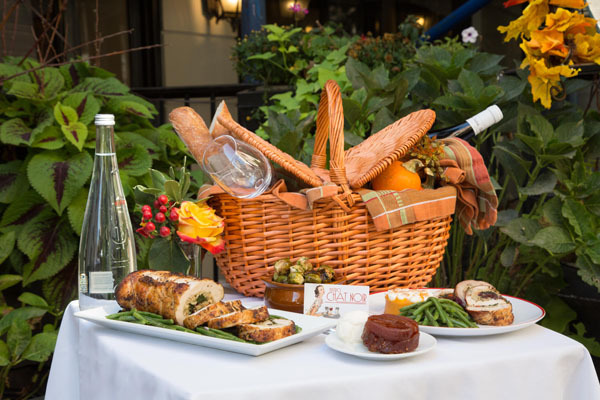 To place an order for pickup on Wednesday, November 22 or Thursday, November 23 (before noon), call Bistro Chat Noir at 212.794.2428. All orders must be pre-paid and placed by 5:00 p.m. on Thursday, November 16th.